How Can I Soften My Shower Water? If you’re tired of dry, itchy skin, dull hair, and water spots covering your shower doors and walls, you might be considering softening your shower water. 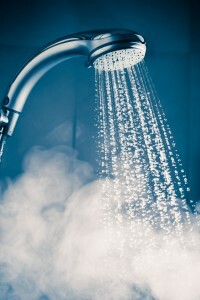 One of the ways you can do this is by installing a showerhead water softener. These types of softeners can be priced at around $200 and claim to remove the calcium and magnesium that cause water hardness. If this is a route you’re interested in taking, beware of some shower filters that will claim to soften water, but fail to chemically change it. Aside from installing a showerhead filter, you can also consider adding bath salts or baking soda to your baths as a way to offset the drying effects of hard water, but you’d have to take a bath instead of a shower. Regardless of whether you try a remedy like baking soda or install a shower filter to treat hard water in your bathroom, keep in mind that these solutions fail to help you with all other issues that hard water causes. If you’re experiencing the negative effects of hard water, such as clothes that look dingy and feel rough after being washed, constant limescale deposits in your bathroom, and dishes that are plagued by water stains, installing a shower water softener won’t resolve these issues. Instead of trying to take shortcuts when dealing with water hardness in your home, consider installing a whole-house system that will provide long-lasting results. A RainSoft water softener, for instance, can help eliminate the problems caused by hard water throughout your house. That’s because our system removes hard water minerals at the point where all water enters your home, ensuring that the shower isn’t the only part of your home getting treated. Learn more about how RainSoft can soften the water in your home and schedule a complimentary in-home water test by calling RainSoft today.